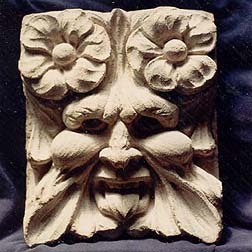 Stone Carved Greenmen for fountains or architectural features. At Ferree Studios, we enjoy designing and carving original works of art. Greenmen are a favorite subject for carving. They are fun to carve and fun to look at. 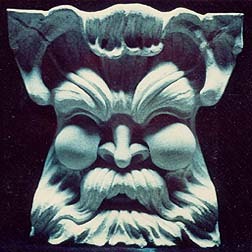 A Greenman carving can be easily integrated into entryways, fountains, or architecture accents of buildings and homes. They can also be displayed on shelves, table tops, walls or architectural accents for buildings and homes. A Greenmen is a sculpted figure or face with foliage incorporated into the design. 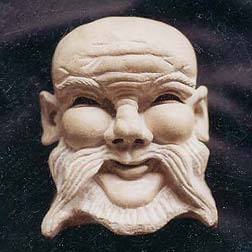 A Greenman (man with greenery) can be carved with leaves, grapes, fruits, vines, or even flowers. 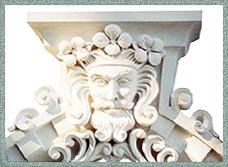 Contact Ferree Studios for a custom stone carved Greenman. Include information on where and how you would like to display your custom made Greenman, and what size you are looking for. To see more examples of our Greenmen visit our gallery of fountains page. Please keep in mind that all of our work is hand carved in stone, unique, and one of a kind works of art. Every piece is hand carved in our Pennsylvania Studio and completed on a first come first serve basis. Because each piece is created individually there may be slight variations from the above photographs. Shipping for each item is free in the continental United States.